Hong Kong is another island country which is as beautiful as it is attractive. The colonially titled Victoria Harbour takes us back to the glory days of British imperialism but when the sun begins to set, the city actually glows alight with a million edifices that cause an incredible transformation. 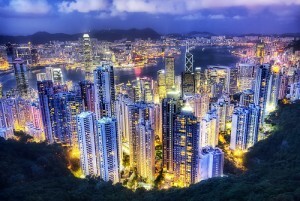 As one of the major economic hubs in Asia, Hong Kong is also glitzy and full of myriad skyscrapers which turn into floodlit sentinels for the future in a dazzling and comprehensive orchestra of light. The skyline of Hong Kong gives inkling to the fact that it is one of the busiest of world cities. It is full of life although the capitalist system on which it is founded is not without its problems with huge areas covered with smog as well as pollution. It is a country of contrasts where there is also a social divide although independence from the British in 1997 brought it closer to China which made it seem that more equitable. Hong Kong boasts that it is among the top tier for worldwide economic trading being 11th in this category whilst it also the biggest source of direct investment from foreign sources in the Asian economy. It’s a great country to be a tax nomad in too but more on that later. Hong Kong began its life as a rather neglected and sleepy outpost of the massive Qing Dynasty but grew substantially in importance when the British got hold of it in 1840. Here the island which was no more than a small collection of farms and fishermen ended up embroiled in the bloody Opium wars which saw a fierce and protracted battle between the Qing Emperor’s soldiers and the mighty British redcoats who had no problem in annexing the island through the brute use of force. The Treaty of Nanking which followed suit eventually handed over the island of Hong Kong and other territories over to Britain for the foreseeable future. Another Opium War in 1956 saw Britian acquire more land along the Kowloon Peninsula. The British then signed a 99 lease with China for occupation of the islands which came to an end in 1997. However Hong Kong and its adjacent islands flourished considerably under British rule. The islands were strategically extremely important since they were located between Singapore (another recently acquired British possession) and Japan with the focus shifting from a trading outpost to an important centre of manufacture. Hong Kong saw incredible rates of growth as hundreds of thousands of Chinese migrated to it and worked in the light industries that developed all across the islands. The country grew considerably in prosperity and was probably the most prized economic prospect of the British Empire up till the Second World War. The British expats lived in considerable comfort in their palatial villas and time almost stood still. All this changed with the Japanese invasion in 1940 where the island remained occupied for almost five years and suffering considerable damage to its infrastructure and economy. After the war the British still regained control but the islands were a shadow of themselves. The Communist takeover in China in 1947 led for an unstable relationship since the Chinese wanted the islands back for themselves and the British still sought Hong Kong as part of its empire. The country continued to recover and the economy boomed once again achieving near record growth levels. China and the UK signed an agreement in 1984 which eventually allowed changeover to the Chinese for Hong Kong when the British lease expired in 1997. Thirteen relatively successful years followed with the economy growing exponentially and billions of dollars coming to Hong Kong in foreign investment. The handover back to China which took place in 1997 was a nostalgic affair with several recalling their fond association with the British who were relatively benevolent masters. There were also some fears that China would exert considerable control over Hong and make it into one province again but almost 15 years later, these fears remain unfounded. Hong Kong has been given the status of a Special Administrative Region and is governed under what has been trumpeted as the ‘one country, two systems’ policy. Hong Kong remains relatively free in all economic matters and China only controls defence and foreign affairs so there is a certain degree of autonomy. However voting rights and universal suffrage are still thorny issues with absolutely no developments on these two important fronts. The Hong Kong Special Administrative Region is currently headed by Donald Tsang who won re-election in 2007. He has been a relatively benevolent CEO allowing the pro-business climate of the region to grow and allowing for a smooth transition between a British dominated economy and a Chinese one. The currency used in Hong Kong is the Hong Kong Dollar and the country had a GDP of almost 1.9 trillion Hong Kong Dollars in 2002. This translates into a GDP growth of 1.2 per cent. The labour force is currently close to 3.8 million whilst the total population is around 7.1 million persons. Hong Kong has several public holidays which number seventeen and these also include twelve statutory holidays. The territory of Hong Kong is made up of Hong Kong Island itself, the Kowloon Peninsula, the New Territories and a further 262 islands. Victoria Harbour is one of the deepest in the world and is also one of the most famous. The total land area of the country is 1104 square kilometres with less than 25 per cent of this being fully developed. Hong Kong also has a substantial part of its land area dedicated to nature reserves and parks and this amounts to around 40 per cent. Hong Kong has a typical sub-tropical climate with the average mean temperature for winter being around 10 degrees Celsius and that of summer around 31 degrees Celsius. It is usually very cool and dry during the winter with most of the rainfall coming between the seasons of Spring and Summer. The average annual rainfall is around 1925mm. With a population of 7.15 million in 2012, the country has quite a high density of people per square kilometre which is a staggering 6620 – one of the densest in the world. Out of the population, 92 per cent come from Chinese descent with the rest coming chiefly from the Philippines, Indonesia and the United States.